Go green for Earth Day with the brightest haircolors under the sun! We talked about “Green Hair” in one of our earliest posts (here at realhairstyles.net.) We covered the grassy shade in honor of Earth Day. Above is the example from back then that came from Urban Outfitters. WE thought the verdigris strands were gorg, but didn’t expect many of you to agree. At that time, only the boldest celebs wore shocking haircolors (think Avril Lavigne, Nicki Minaj, Rihanna and Katy Perry.) Of course girls and women in their 20s have long chosen color their hair on the wild side to reflect their independence, peer group or to choose something just for the fun of it! Only a few years ago, unnatural colors were rare among the rich and famous. Now green fits one of the “in” color trends now: bold brights, pastels, neon or rainbows. Toda y’s celebs who are dipping into the cool color pool include names you might expect like fashionista January Jones, who recently went from sleek to pink. But then there’s actresses you wouldn’t expect to stray from the ordinary. For instance, gorgeous Jaime King has gone from blond glamour to true blue, green, yellow and some shades in between. It seems like celebs are wearing unusual hues because they’re sure to get free publicity. Just think how many times you’ve seen news about another star going technicolor! 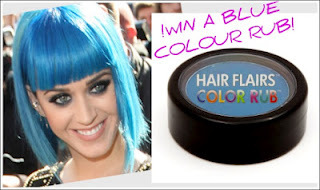 And really there’s no reason not to follow the movement: simply use temporary dye, feathers, extensions or even “chalk” coloring (Katy does hers with HAIR FLAIRS COLOR RUB). These modern-day tools let you enjoy the look while it’s hot without making a long-term commitment. This entry was posted in real hair, star hairstyles. Bookmark the permalink.